Put problem concerning Views, Layouts and other XML-Resources (like AndroidManifest) here. for a project i'm working on i created small (~230 lines of java code) color picker dialog. Last edited by pskink on Wed Feb 03, 2010 9:30 am, edited 1 time in total. Your dialog looks great. One idea for showing the alpha is to cut your color output display in half. 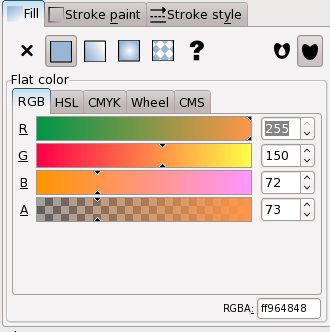 On the top half show a fully opaque output of the color like you are currently doing, but on the bottom half draw the color with alpha over a colorful logo or perhaps country flag, so that users can see the effect of the alpha. BUKsAPPs wrote: Your dialog looks great. One idea for showing the alpha is to cut your color output display in half. On the top half show a fully opaque output of the color like you are currently doing, but on the bottom half draw the color with alpha over a colorful logo or perhaps country flag, so that users can see the effect of the alpha. BUKsAPPs wrote: One idea for showing the alpha is to cut your color output display in half. On the top half show a fully opaque output of the color like you are currently doing, but on the bottom half draw the color with alpha over a colorful logo or perhaps country flag, so that users can see the effect of the alpha. Last edited by pskink on Fri Feb 26, 2010 1:13 pm, edited 1 time in total. as i don't have access to real device, could anyone test it on their phone? So, I guess nobody has tested this for you? I have, and it works fine. Although I'm not sure of your icon choices for the alpha channel test. I'm pretty sure the standard for adjusting transparency is to have half of the picture display that checkered pattern everybody uses. Sort of like what's seen in this link. I think if you filled the entire bottom box with that graphic it would be perfect. Anyway, as it is... Would it be all right if I used it in my application? StandardBlueCaboose wrote: So, I guess nobody has tested this for you? Awesome dude.... what im looking for... thx alot. Thanks a lot for sharing all your work.. Done! Thanks for letting me know about other good stuff ! Last edited by carla23 on Sat May 25, 2013 9:12 am, edited 1 time in total.